We are big fans of TED here at Surf Simply; in a digital landscape saturated with informational and motivational videos, the TED talks (from their annual conference in Longbeach, California and now from their independently organised TEDx events) are consistently amongst the best out there. Their tagline “ideas worth spreading” applies to everything from an Al Gore presentation on averting the climate crisis through to Sir Ken Robinson’s presentation on why he thinks schools are killing creativity, so when somebody stands on stage in front of the three big red letters and talks about something to do with surfing, we tune in. Just before Christmas a talk was uploaded to the TEDx feed featuring British wooden surfboard maker James Otter speaking at the 2014 TEDx Brighton event last October. What was interesting was that James didn’t talk about why he chose to start building surfboards out of wood or put forward a case for the environmental benefits of alternative materials in surfboard construction – the obvious direction that you might expect such a talk to take. 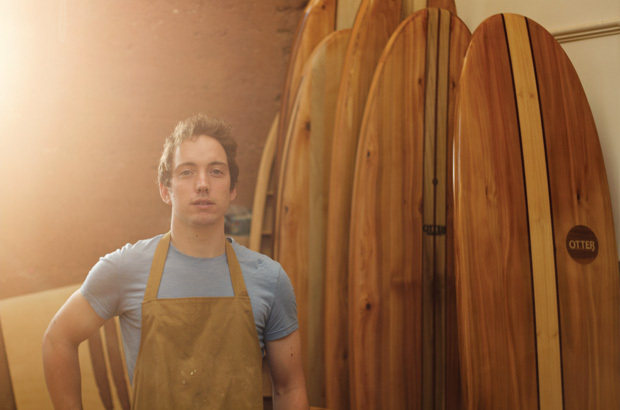 He chose instead to discuss why he began sharing his knowledge with customers and helping them to build their own wooden surfboards, and how this process has ultimately proved just as personally rewarding to him as the act of crafting the surfboards himself. 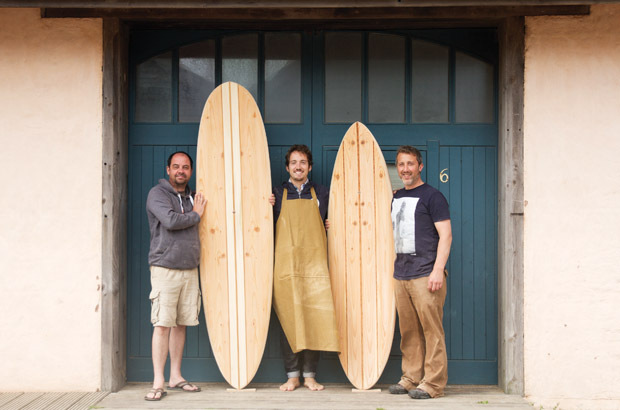 We recently caught up with James to find out a little bit more about his beautiful wooden surfboards and the workshop courses that he runs to help surfers to build their own. James, you build custom wooden surfboards, but you also help people to build their own on week-long courses that you run. Did it feel like you were taking a risk, teaching people to do it themselves? The first time I shared the making of a wooden board was with a chap from a few villages away. He was into making things out of wood and really fancied having a go at it so, whilst I was a little apprehensive, I soon learned that the joy I got out of sharing the excitement of making your own surfboard far outweighed anything else. Since then I have found that actually what we do facilitates in helping people to do something that they wouldn’t necessarily do on their own. The necessary knowledge and machinery to get everything prepared and having a process that we are confident will produce great surfboards in turn gives people the confidence to get making and makes the process much more accessible. I personally find it much more rewarding to share what I do with others too. I don’t think I could be just one man in a shed; I really enjoy the energy and excitement that builds up through the week as we share such a great experience with an intimate group of likeminded people, all with their own stories to tell too. They make surfboards and we make friends. The vast majority of surfers are used to buying a board straight off the rack or ordering a custom from their local shaper. How has the surf community responded to this new opportunity that you’re offering? It feels as though the whole surf community has shifted over the past decade. There used to be a division between longboarders and shortboarders, but now the majority of people have become much more open minded, where they will ride any kind of surfboard. 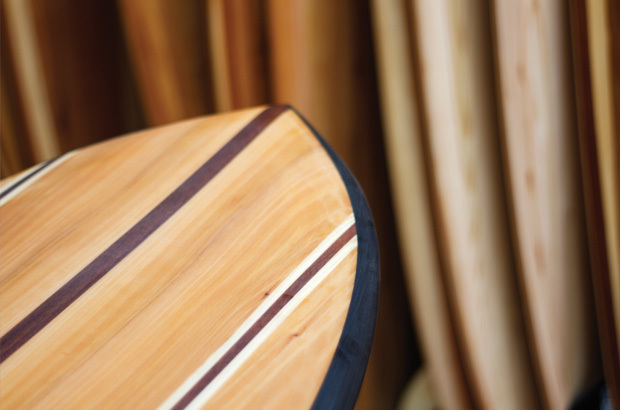 Surfboards of different shapes, sizes and materials are now the norm in a lineup, which our wooden surfboards fit into nicely as an “alternative” surf craft. I also think this open mindedness has tied in with consumers being much more aware of what the implications of where they spend their money are. 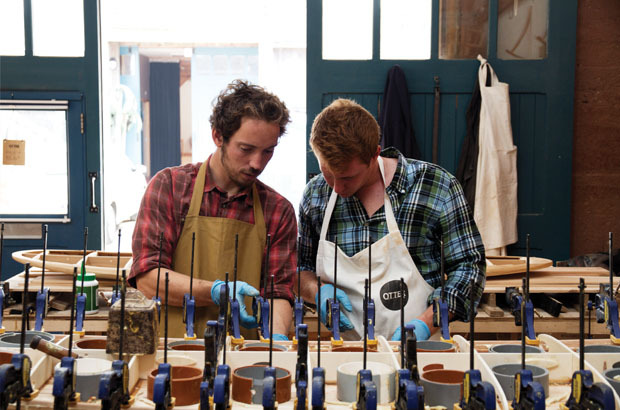 They like to know and learn about the materials that go into making products, the people behind them and the process of making them, but more than ever before people want to be a part of the making process. I feel that making is an intrinsic part of all of us that many of us are forgetting about and we are here to give people the confidence, encouragement and support to get started again. Why do you think that this option is proving so popular? It’s a bit of a no brainier….would you like to own this handcrafted, locally grown wooden surfboard or would you like to take a week out of your life to handcraft your own wooden surfboard, learning the process along the way and get to know the people behind the product, hopefully surfing on your lunch breaks? If we can help build a stronger connection to the products we surround ourselves with, we are much more likely to care for them and help them last for years, if not decades. 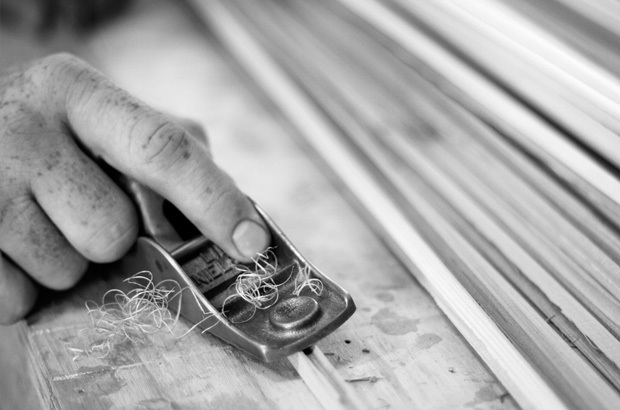 By sharing the experience of making our surfboards with our customers that’s exactly what they are able to do. Surfers are faced with a real range of material and construction options when shopping for a new surfboard these days. What does wood offer in comparison to traditional foam and fiberglass and the other alternatives available? With our wooden surfboards, the first thing we aim to do is make them to last, so they are stronger than a typical surfboard. As a result of how we make them, they tend to finish about 30% heavier than a traditionally made polyurethane board. At first this seemed like it was undesirable, but we then developed shapes with this in mind, leaning towards the outlines of the single fins and twin fins that are all about glide and momentum, which is allowing us to see the real potential of making boards the way we do. We are finding that these shapes actually suit a huge majority of surfers too, who need surfboards that will allow them to catch lots of waves and enjoy riding them whatever the waves are doing. 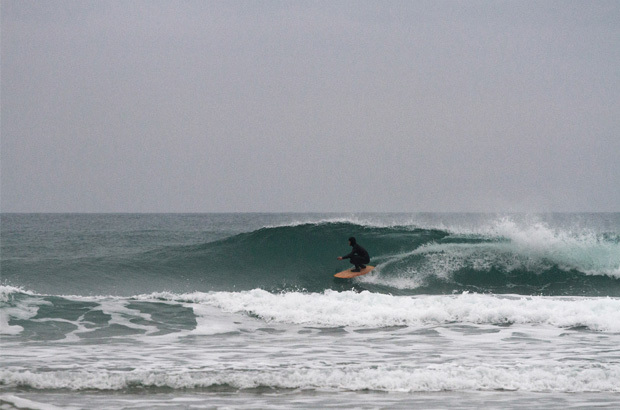 The style of surfing when you’re riding single fins and twin fins also has to be much smoother as you work with the board and wave to make the most of any situation, which is helping to improve people’s surfing too. For me, the reason I began doing it was an environmental one. I wanted to find a way of making long lasting surfboards with the least environmental impact and this remains at the core of everything that we do and we are constantly striving to reduce our impact on the world around us more and more. After all, no planet: no waves. How do the wooden surfboards that customers build on one of your courses compare to the boards that you build yourself. If I admitted to having messed up assembling flat-pack furniture before but wanted a beautiful surfboard that I could hang on my wall, would I be a fool to sign up to one of your courses and buy a plane ticket? Well, I personally am a bit of a perfectionist, which means that I’m not happy letting anything leave the workshop that I am not completely happy with. I’ve also made a fair number of wooden boards now, and am always learning and improving, so I’d like to think that the ones that bear my signature on the bottom are a few levels above the ones that our workshoppers make. However, I have found that the best way to ensure that the workshoppers surfboards are as good as they can be is to limit our class numbers so that anybody with any amount of experience in woodworking can come along and have full confidence that the board they end up with will be beautiful, strong and well crafted. They may not end up completely perfect, but that is the beauty of handcrafting and learning; at least you will know that you made it with your own two hands. In your talk you share your experience with Luca, who turned the tables and took you out of your comfort zone in your own workshop. Will you now be offering charred rails as an optional feature on your surfboards in the future? In the moment it was an exciting process, but very difficult to keep control of and we ended up having to do extra work in the laminating phase to neaten up some of the edges of the charring, so it’s not something I plan to offer as an option. 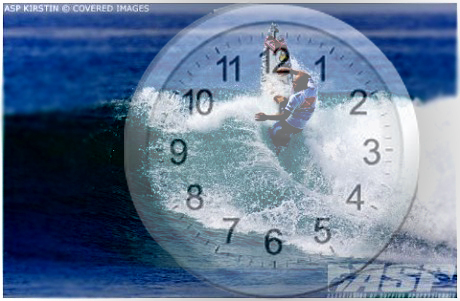 But, each board is personal to each individual so we are happy to try anything out as and when people ask about it. All we can do is open them up to our experiences and do our best to get their dream board under their feet. With the workshop boards it is a little different as the people building them can do anything they want to them to change the way they look, feel and ride. All we will do is let them know of the risks and possible hiccups, so it all comes down to what those individuals want from their experience. Presenting a TED talk must require you to watch a fair few in preparation. Can you recommend some of your favorite TED talks to our readers please? Okay, I’m a big fan of TED as there are so many inspirational people out there. There are a number of talks that jump to mind, but a must watch is Sylvia Earle – how to protect the oceans. For more information about the wooden surfboards that Otter produces and to find out about the “Build-Your-Own” wooden surfboard courses that he runs, check out www.ottersurfboards.co.uk.